I woke up after everyone else, because I had stayed up late sending couchsurfing requests - this actually was very fortuitous, because one host had accepted my request by the time I woke up! Jurate and Nerijus had prepared some breakfast of pasta and leftovers from dinner, while Jared had his own small snack. I turned on the TV to find that there were only 3 stations, and they were all playing the same thing, a kind of scrolling news feed. We left the hostel around 10:30am, and it was cold outside. Our car was the dirtiest there. We drove to Myvatn lake and stopped at the N1 station for Jared to get a full breakfast. Then, onward: There was a sign to a farm named Björk, where we of course stopped for pictures; I scraped the palm of my right hand as I hung from the sign. 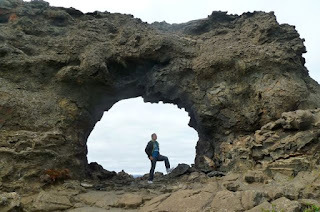 Then we did a hike (the Church Circle) around some surreal lava formations at Dimmuborgir. It was very cool, and we were able to climb into a few caves in the rock. We then realized how little time we had (because we had to be in Akureyri by 5pm for Jared to catch his bus), so we rushed to the next stop, a small hike next to a farm. There were odd lava columns next to pleasant ponds filled with birds and midges. 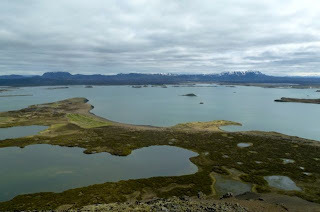 We hurried onward to the pseudo-craters of southern Myvatn lake, which were relatively unimpressive (relative to everything else that we've seen in Iceland). 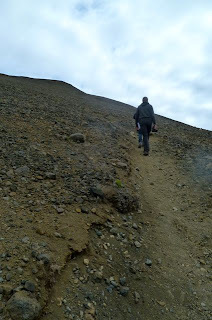 The big thing that we wanted to do was to climb Vindbelgjarfall, a distinct and tall mountain that overlooks the entire Myvatn area. Jared decided to take a break and wait in the car, while the other three of us set out to climb the mountain. It was quite the climb - first taking 20 minutes down a path through thickets of brush, then 30 minutes up a strenuous and slippery slope up the side of the mountain. Most of the mountain was just rocks with absolutely no vegetation. The weather conditions were cold and windy, but the hike was so steep that I was sweating halfway up. The view from the top really was breathtaking - a panoramic view of the lake and all the surreal subarctic volcanic landscapes. Unfortunately time was pressuring us, so we rushed down the mountain, taking care not to slip. we jammed into the car, panting, and drove on. We stopped at Gothafoss,yet another scenic waterfall, right next to a gas station, where we also topped up our gas. 30 seconds to take pictures of the waterfall, and we headed straight through to Akureyri. We got there at 4:45, just in time for Jared to make his bus. Akureyri is Iceland's second largest city. After 4 days on the road passing through remote seaside towns, it did feel like a change of pace to be in a city of over 10000 people and with more than one main street. We explored the church overlooking the city and then checked out the botanical gardens. The gardens were nice, full of plants from around the world, which makes you wonder how such plants grow in such an extreme environment. Beyond that, however, I didn't find the gardens very appealing, compared to the spectacular mountains and fjords surrounding us on all sides. 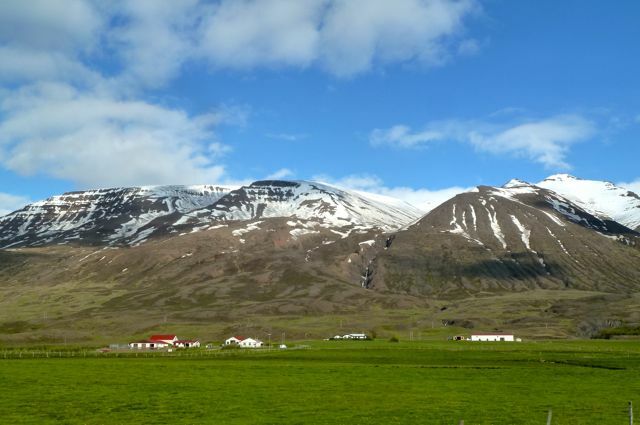 I don't think I can overstate how amazing the scenery of Iceland is. Driving through the countryside, the scenery changes every 5 minutes to an entirely different ecosystem. There are waterfalls cascading down the sides of mountains; there are small pockets of forests; there are wind-swept cliffs covered only with moss and lichens; there are grassy fields with sheep grassing onto the road; there are fields of volcanic lava with absolutely no vegetation; there are mountains with their highest ridges terraced like a demonic looking fortress. Everything here is simply incomparable to most anywhere else on earth. There hasn't been an uninteresting view for me so far, which makes it very difficult to focus on anything besides looking outside in awe (such as writing travel blog updates). We drove straight from Akureyri to Blönduós, where we had a couchsurfing host, Christina. 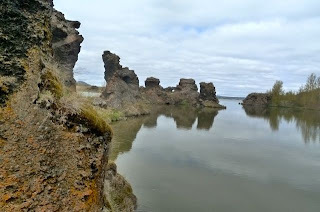 Blönduós is a very small town of about 900 people, known (in my guide book at least) as having an ugly church shaped like a crater (but actually it's shaped like a horse's hoof), but the town is situated right where a river flows into the sea and is thus very scenic. We arrived at Christina's apartment and quickly settled in, making ourselves some eggs for dinner. Christina had a cat, Krik Krik, which Jurate and Nerijus instantly loved. We had dinner around 10pm, with the sun shining brightly in through Christina's big windows. After dinner we decided to walk to the gas station to buy something sweet; it was a nice walk in the late evening sunshine. We chatted with Christina and played a bit of Sporcle before I noced that my internet connection had gone out - turns out that there was a power outage! The bathroom became candlelit and I hoped that electricity would return overnight and that my camera would charge. I slept on the couch while Jurate and Nerijus took the floor in Christina's extra bedroom.